UPDATED: Sun., Jan. 28, 2018, 10:18 p.m.
SEATTLE – Despite all of the struggles and inconsistencies this season has served up for Washington State, the one thing the Cougars have been able to maintain is their 3-point marksmanship. Among the 347 basketball-playing schools at the Division I level, it’s essentially unparalleled. Entering Sunday’s rivalry game at Washington, WSU ranked second nationally in 3-point makes per game (11.9) and the Cougars this season have been the gold standard in the Pac-12 Conference, leading in total makes (226), attempts (577) and 3-point percentage (39.2). In their first season under coach Mike Hopkins, the Huskies have been on the opposite end of that spectrum. But on Sunday in the second chapter of the 2018 rivalry series, they decided to try on the Cougars’ shoes. Matisse Thybulle and Dominic Green each swished three triples, UW made 11 of 25 as a team and the Huskies overwhelmed the Cougars with a few destructive runs to pull away with an 80-62 blowout win at Alaska Airlines Arena. Presuming the Evergreen State nemeses don’t run into each other at the conference tournament, the Huskies, who won 70-65 in Pullman earlier this month, have their second season sweep of the Cougars in three seasons. WSU won both games in 2017. The Cougars controlled the lead for the first time when Robert Franks got a jumper to fall, followed by a layup from Milan Acquaah to make it 25-23. But over the next 4:51, every single shot thrown up by a WSU player fell short, long or wide. The Cougars missed six shots in succession, and two free throws, but came out of the drought relatively unscathed because the Huskies, also, couldn’t buy a hoop. Viont’e Daniels broke WSU out of the slump with a corner 3, but the Cougars followed that with another painful stretch on offense. They missed their next four tries from the field and went more than four minutes and 30 seconds without adding to their score. It was much more costly because the Huskies then proceeded to make each of their next seven shots and an 18-0 run vaulted them to a 17-point lead before Franks’ bucket – one of just three for the Cougars during the final 10 minutes of the half – cut the halftime deficit to 45-30. Drick Bernstine was successful for a small sliver in the second half. He scored nine of the team’s first 12 points out of the break and assisted on the other three, feeding an inside pass to Franks, who converted an and-one layup that made it a seven-point game. That could’ve been the bucket to fuel a WSU comeback. Instead, after two more shots from Bernstine to close the gap back to seven, the Cougars hit another offensive standstill. This time, they went almost seven minutes without making a shot and the Huskies used the span to put their rivals away. Franks and Bernstine were the only double-digit scorers for WSU with 16 and 13 points, respectively. 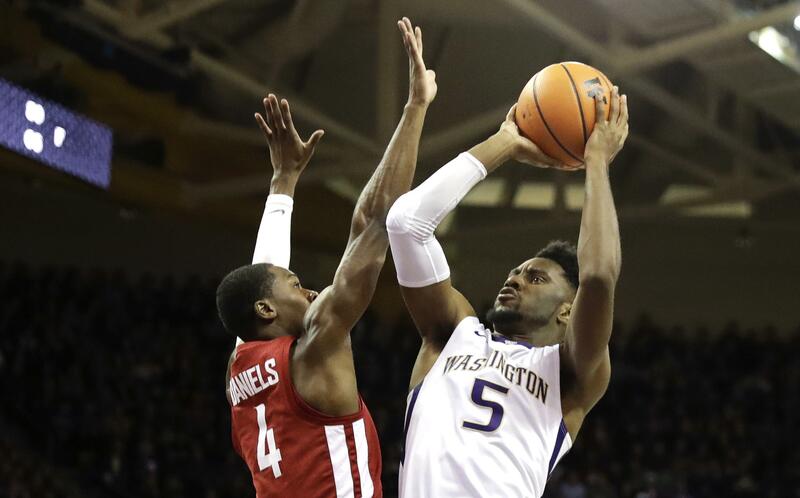 UW’s Thybulle stuffed the stat sheet, scoring 18 points while assisting six times and notching four steals. Husky freshman Jaylen Nowell scored 14 points and Noah Dickerson tacked on 13 more. The Cougars (9-11, 1-7) have now lost 10 of their last 13 games since winning the Wooden Legacy. They’ll host two ranked opponents next week: No. 11 Arizona at 7 p.m. on Wednesday and No. 21 Arizona State at 1 p.m. on Super Bowl Sunday. Published: Jan. 28, 2018, 9:14 p.m. Updated: Jan. 28, 2018, 10:18 p.m.